The Buick brand is 110-years-old. Does Riviera have a future in Buick? Until GM killed off Saturn, Opel was the product partner for the planetary brand. With Saturn out of the way, Buick has taken over that spot with its Regal sedan representing its current and only Opel-derived offering. Yes, you can make a case for the Buick Verano, too, which is based on the Chevrolet Cruze platform, itself based on the Opel Astra. GM is not satisfied with stopping at five model lines for the expanding Buick brand. Buick had retracted to just three model lines following GM’s restructuring and will most likely add a sixth model as early as next year when a compact crossover slots between the larger Enclave and the smaller Encore. That would give Buick three crossovers and three sedans for its customers, but there are still product line holes to fill, namely coupes that might bolster the brand. Fortunately for Buick, GM chairman Dan Akerson likes what its European Opel division is serving up these days and has mentioned two models that would look “awfully nice in Buick showrooms,” reports Automotive News. The two Opel-supplied models plus one luxury concept might someday bring Buick’s product portfolio up to nine models. The Opel Cascada is a 2+2 cabriolet. The Cascada shares its platform with the Buick Verano and would be an attractive although pricey addition to the Buick line. This 2+2 convertible has been positioned to compete with the Audi A5 cabriolet, but its current engine line up including a 1.4-liter four cylinder engine would likely have to be upgraded for the American market. Perhaps nothing smaller than a 2.5-liter four would be appropriate as might the 2.0-liter diesel engine currently available in the Chevrolet Cruze. The estimated cost of a U.S.-spec Cascada is about $40,000. Chevrolet has the Spark minicar and Buick could get a minicar of its own. The Spark originates from Korea, while the Buick would seemingly be based on the Opel Adam, that brand’s answer to the Fiat 500. This cute, three-door hatchback is powered by a family of small four cylinder engines, seats four and is expected to be joined by a convertible model within a few years. Just as the Mini Cooper is a profitable vehicle for BMW, a Buick Adam might do likewise for GM. Opel’s Fiat 500 and Mini Cooper competitor. That Buick enthusiasts want to see the flagship Riviera return is a given. The latest Buick Riviera Concept was shown at Auto Shanghai 2013, and was jointly designed by Shanghai and PATAC design teams. 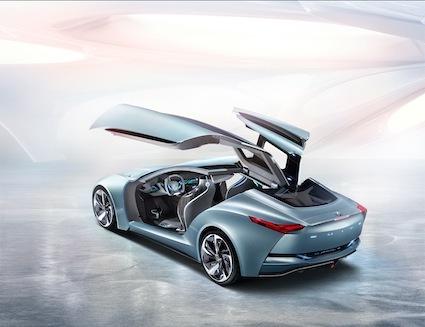 It is a halo model with gull-wing doors and will at the very least provide inspiration for future Buick models. What would keep GM from investing in a high-end Buick? That would be Cadillac, its luxury brand, one with its own aspirations for a six-figure signature sedan. GM’s financial picture has vastly improved, but perhaps not to the point where both models would be supported. GM has been touting Buick as a “modern luxury brand” in recent advertisements, muddling its position in the GM line up. Clearly, Cadillac is its sole luxury brand with Buick fitting squarely between Chevrolet and Cadillac. The brand is marking its 110-year anniversary this year and its future is certainly much brighter. Indeed, sales this year are up 16 percent, outpacing GMC and Chevrolet. Our internal auto trends has Buick adding at least one coupe over the next few years. As progressively tighter fuel economy standards weigh in, the Opel Adam might be a fitting addition to the Buick line.